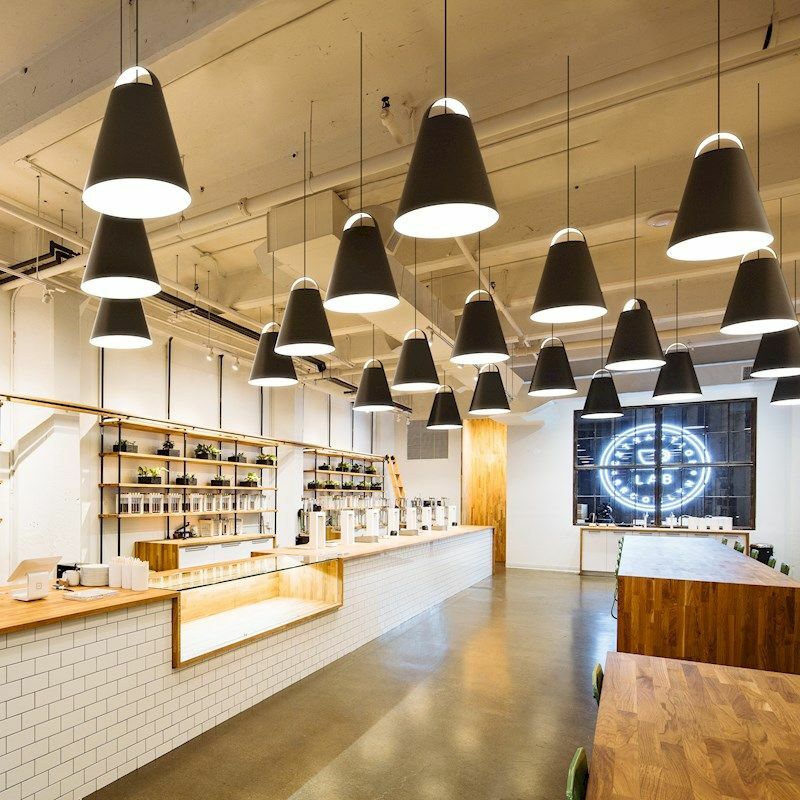 While the type of lighting you choose for your store may seem trivial, the reality is that customers will either feel welcomed into your store or turned off. These simple steps will ensure that you are on the right track for meeting your store’s lighting needs. You’ve pored over every detail of your new business: You’ve created a business plan, worked up a marketing plan and devised an airtight budget. Now that you have checked all the boxes, it is time to focus on your business’s interior. While it might not seem very important – one big component of planning your business’s layout is the lighting. While the type of lighting you install in your store may seem insignificant, it can actually make or break a customer’s shopping experience. The type of lighting you use affects the “feel” and mood of your store, so it is very important to get it right. For example, no one wants harsh, fluorescent lights in their dressing room, nor would you expect to see dim lighting in a bakery. The following guide will help you understand different types of light bulbs, various kinds of lighting and the situations or businesses that they are appropriate for. It will also help you choose the best type of lighting for your business, taking into consideration your budget and merchandise. There are four different types of light bulbs designed for indoor lighting: incandescent, halogen, fluorescent and LED. Each type of lightbulb has its place and pros and cons. Many business use combinations of light bulbs to achieve overall lighting for their store. Incandescent light bulbs are typically inexpensive and emit a nice, warm light in all directions. However, they lack energy-saving properties, so they may hike your energy bill. They also have relatively short lifespans, so you may find yourself replacing them frequently, which is a hassle for any business owner. Fluorescent light bulbs are cost-effective and long-lasting. On average, fluorescent bulbs last 10 times longer than incandescent bulbs. This saves you money and the hassle of constantly replacing your light bulbs. Since they are typically energy efficient as well, you will save money on your electric bill. There are four primary types of lighting to consider for your store: general, task, accent and decorative. As with light bulbs, you will most likely integrate a combination of different types of lighting to achieve the overall look you want for your business’s lighting. It will depend on the type of business you run and the feel that you are going for. General lighting, also called ambient lighting, is the main type of lighting that you use throughout your store. When choosing ambient lighting, it’s important to select a light source that illuminates your store so that it does not feel dim or gloomy but also doesn’t overlight the room, which can create a harsh feeling throughout your store. When choosing ambient lighting, consider the type of business you operate. If you have a coffee shop, you don’t want harsh lights shining down on people while they enjoy their coffee or chat. If you own a toy store, you do not want customers struggling to see the merchandise. Accent lighting can add special flair or “oomph” to specific areas in your store. For example, if you have jewelry or another product behind the counter, you can use accent lighting to highlight these products. Typically, store owners use spotlights or track lighting to highlight certain areas of their stores. Decorative lighting allows you to have a little fun. Unlike the other lighting sources listed above, decorative lighting is purely ornamental. Perhaps during the holiday season, you hang up strings of lights. While a strand of colored light bulbs doesn’t illuminate much throughout the store, it can go along way toward setting the tone or mood of your business. Other decorative lighting sources that are not seasonal include chandeliers, ornamental lamp shades, wall lights, etc. Decorative lighting can give your store some much-needed personality; however, avoid overusing decorative light fixtures. Your store could look cluttered or, worse, the decorative pieces could cancel out the functional lighting. Layering different kinds of light will help you achieve the best look and mood for your store. Not only will it help you highlight different products in your storefront, but it also gives your store warmth and dimension. Layering light can be tricky. Before purchasing expensive lighting, talk to a professional about the best techniques for layering light. It might cost more upfront to consult with a professional, but in the long run, it’s important to get it right the first time.